Let me begin with how thankful I am for this dear friend, W.P. He has been the most supportive of me and my cake adventure. I am thankful and grateful for his supports and his encouragement. 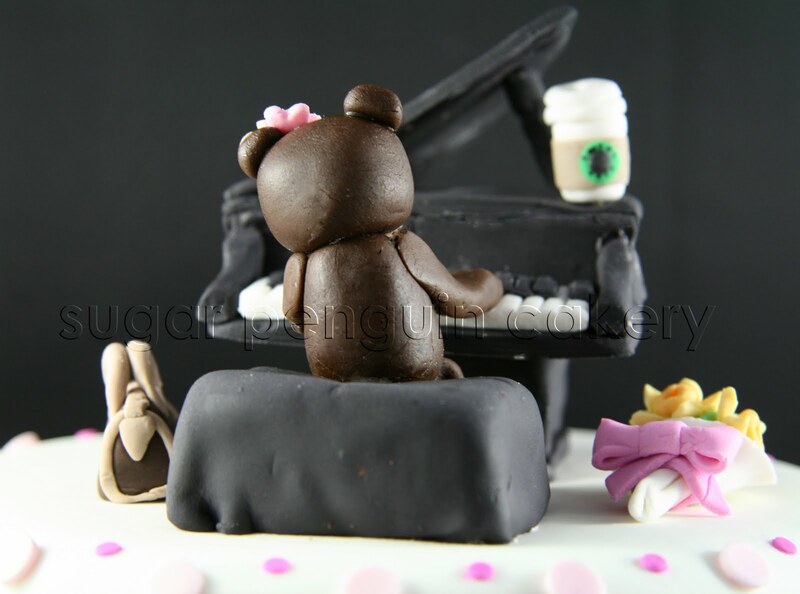 He challenged me by asking me of making a cake for his friend, who likes to play piano. W told me that he'd like to include a few of her favorite things in the cake: her daily starbucks coffee, her love for Louis Vuitton bags, and her favorite flowers, daffodils. At first, I was just about to settle for an upright piano, since in construction, I know that it should be easier than a grand piano. 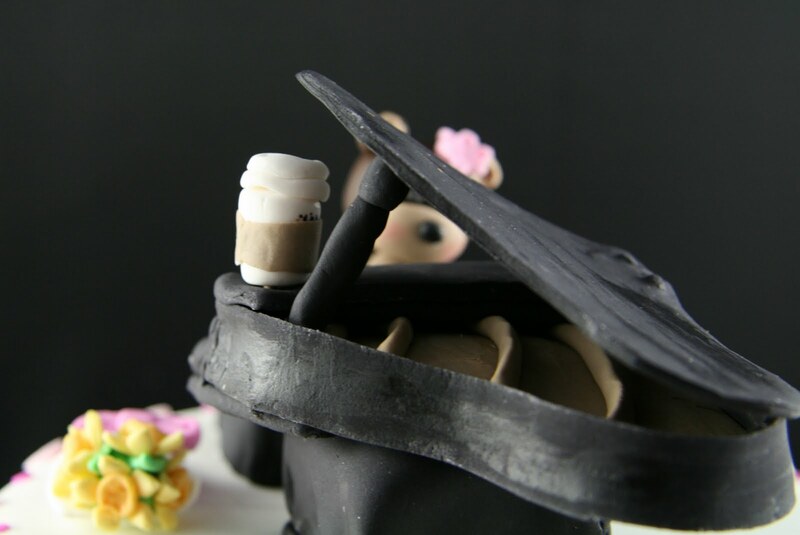 But of course, W requested for a black grand piano. I was flipping through all of my sources, trying to figure out how am I going to make this grand piano. Then I stumbled into this lady who did this UNBELIEVABLY AMAZING CAKE (I'll post later all about her). 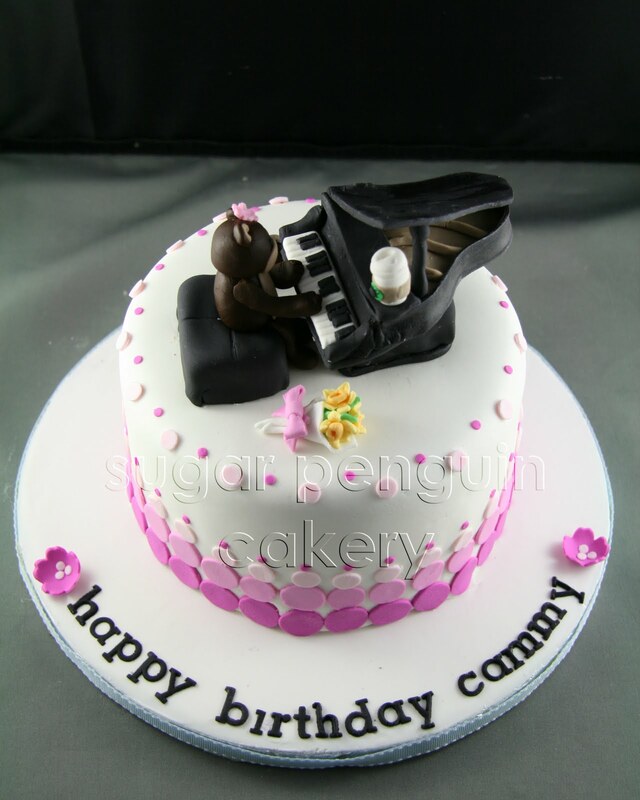 To make the piano, I have to cut several gumpaste pieces for the base, the cover, the keys, and the feet. Then you have to wait for all the gumpaste dry out. At the end, the piano was too heavy to be just supported by three piano feet. I opted for a support in the middle as I didn't want it to collapse. Bonnae did an AMAZING job with the piano keys. She plays the piano, so making those keys came quite easily for her, though it was not easy as she had to painstakingly score each and every key, making sure they are even as believable as a real piano. At the end we're happy with the piano, I think it looks quite amazing. I am proud of that cake. Thanks W., for giving us a chance and challenge us in making this cake and being a part of the celebration. You can see more details in our facebook page. GUCCI...! Calvin Klein...! Giorgio Armani....! Prada....! Burberry...! These brand names came to mind when we have our 'cake challenge' this week. 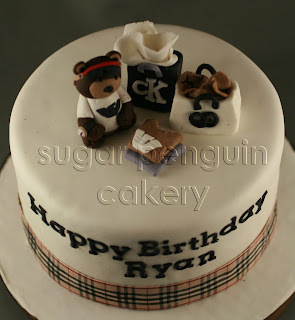 We have to create a cake that would show how fond this brother is of the brand name fashion. 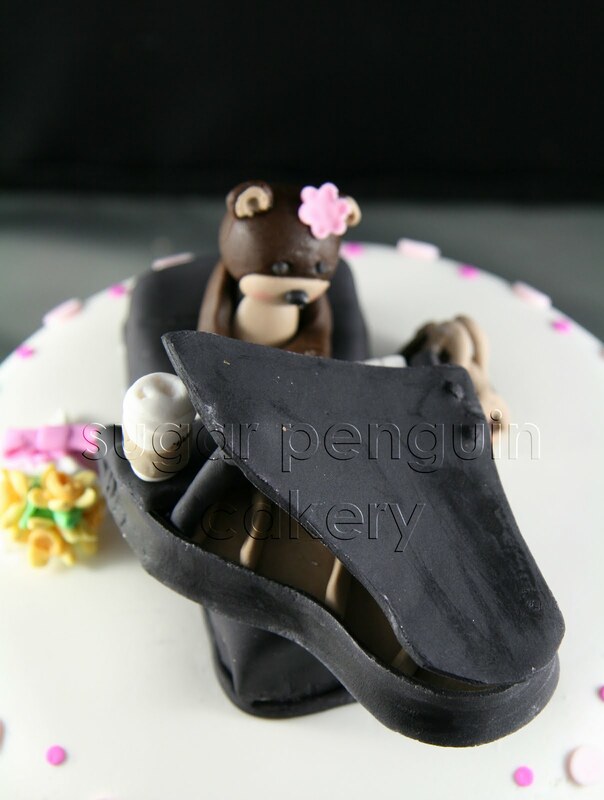 Bonnae and I brain-stormed and we came out with this concept for the cake: a bear wearing brand name t-shirt, in this case, Giorgio Armani, wear a trendy Prada sunglasses. Then we put some shopping bags. For the longest time, we can't come up with Calvin Klein, until my husband showed up with his CK tshirt! Then we stacked some more tshirts for this trendy bear. We kept the design fairly simply to showcase the fashionable bear. Ivone and I created a cake to celebrate my sister (Jo) and niece's birthday. We had to come up with a scene that captured a special moment for an aunt and a niece. We thought it would be so sweet if we had Jo reading to Thea on a couch. The couch and the automan was to resemble the same one in Thea's home. It was our very first time making a couch and it's amazing what the anticipation of making edible furniture can do to two cake lovers! We were giddy for days just thinking about it! As you can see, we pulled it off! We gave Thea a pigtail with a pink bow because her mommy always gives her the craziest hair! We had a purple throw draped over the chocolate automan in case the bears need to get cozy. Jo has always loved reading so we added more books around their "living room." 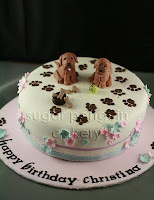 So much fun making this cake. 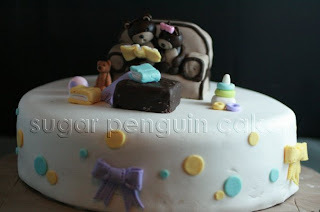 I think it probably took Ivone and I about 5+ hours to make this cake. That's only decorating...baking time not included. It really is a labor of love. But so worth it!